This one features Zaft and a few of its soldiers. As a fan of Gundam Seed Destiny, i download it XD. 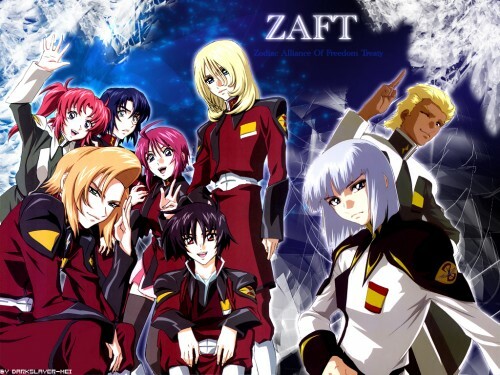 Zaft is my second favourite force. Looks good. Excellent job... well done. Going to my fav. plus I ll download it. I think you should have used colors more suited to ZAFT, not blue and white. Though I like what you did. ^^ ZAFT is awesome as well. Got to love ZAFT and you combined them all well. Oh cool wallpaper, i love how you put all different scans together. The background is very nice as well. Love it. :) Great job. You put different scans together... impressive. The bg is mostly covered up with the scans. Well, it's still a good wallie and the effects are real nice. this one is great dude!